The MATCH opens toward the Main Street light rail line with a public plaza and cafe. The exterior elevations are clad in a variety of different types of corrugated metal. Photo by Luis Ayala. The light and airy outdoor lobby is both economical and surprisingly comfortable in hot weather. Photo by Luis Ayala. The largest theater comes with just a bit of architecture in the form of blue-painted, patterned concrete block walls. Photo by Judd Haggard. The black box theaters are minimally appointed background spaces that defer to the artistic performances. Photo by Judd Haggard. 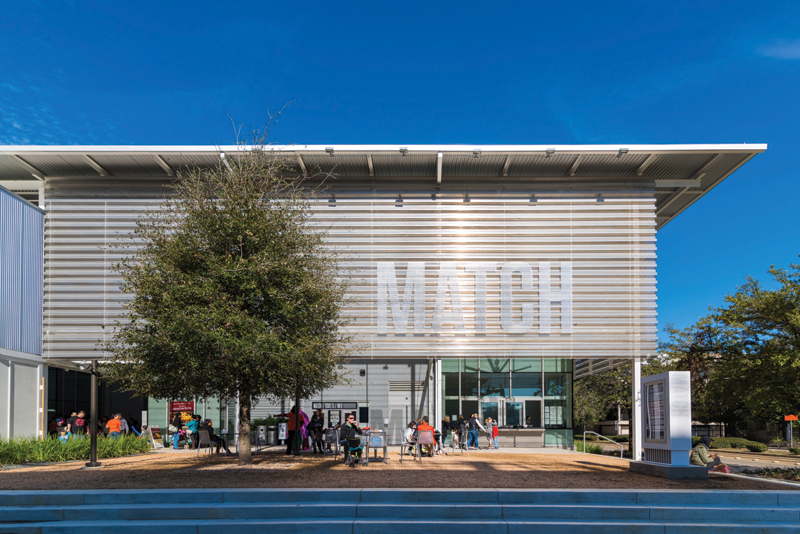 Houston’s newest theater, the MATCH (Midtown Arts & Theater Center Houston), which opened in October 2015, is distinguished by its unusual mission: to serve as an affordable hub for a diverse and changing group of small to medium-sized organizations that might have inadequate or no performance spaces of their own. According to its director, Chuck Still, the MATCH is quite possibly the only institution in the country that supports such a program, something they discovered when they tried to find similar facilities to study during the planning stages. There have been publicly subsidized theaters in Houston since at least 1910, when the city paid for the construction of the City Auditorium, built on the site of what is now the Jesse H. Jones Hall for the Performing Arts (1966). However, these have been planned for the richest and best-politically-connected performing arts organizations in the city — the symphony, opera, and ballet — or for well-attended popular productions — musicals, wrestling events, rodeos, and circuses. Smaller groups have been left to their own devices. The Alley Theatre, for example, started in a small, back-alley building in 1947 before moving up in the art world. Eventually, the Alley built its own major downtown theater (1968), which was designed by well-known New York City architect Ulrich Franzen, FAIA. Today, perhaps, upward mobility in the art world is harder to achieve, and many established arts groups that have been around for quite some time are still forced to cope with inadequate spaces in out-of-the-way locations. 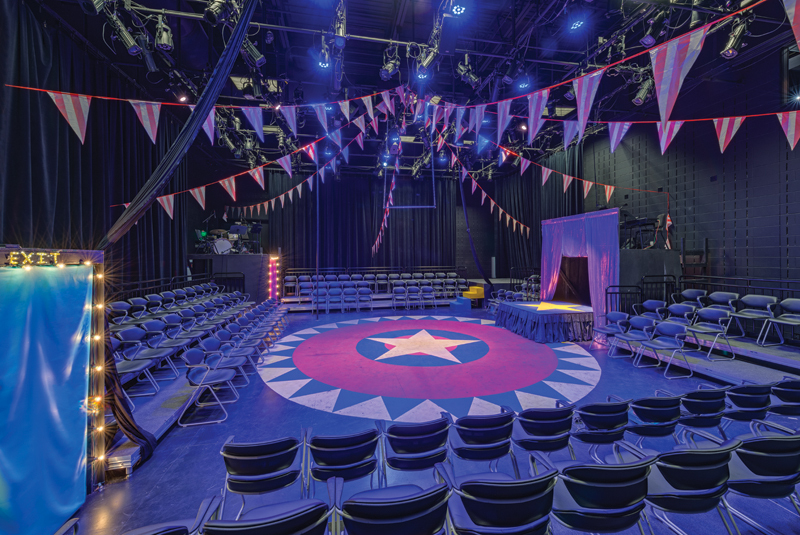 In 2003, a group of four organizations — including Diverseworks, Suchu Dance, Aurora Picture Show, and Infernal Bridegroom Productions — banded together to create the Independent Arts Collaborative (IAC), a nonprofit organization whose mission was to figure out how to build a comprehensive performance venue. The facility would not only be for the use of its constituent members, but for anyone else in Houston needing a centrally located, reasonably priced, and professional performance or gallery space. In 2008, IAC hired Jill Jewett, who had just finished a term as Mayor Bill White’s assistant for cultural affairs, as a programming and fundraising consultant. In addition, Emily Todd, then the Menil Collection’s deputy director, agreed to serve as president of IAC’s board of directors, which was then being assembled. The first big test for the group came in spring 2011, when they were given the first chance to purchase a square block in Midtown bounded by Main, Holman, Travis, and Francis streets. The site was previously the parking lot for the Houston Permitting Center, which had moved to a new location. After some scrambling, IAC was able to cobble together the funds for a $250,000 down payment on the $2.5 million lot in the short amount of time the city gave them before offering it to hungry developers. As is typical in these kinds of projects, many people were involved. In this case, IAC got a boost from developer Bob Schultz, who earlier opened the nearby Continental Club in 1999, and who was concurrently developing the two blocks directly south as The Mid Main — a mid-rise, mixed-use apartment complex with some architectural and urban planning pretensions, designed by Rogers Partners of New York. Schultz agreed to guarantee the rest of the loan for the property and helped IAC to work out a parking deal and broker a 380 agreement with the city to get $6 million in tax breaks over 15 years once the theater project was complete. Once the site was secured, IAC, which around this time had renamed itself MATCH, began to address the architectural component of the project. The collaborative established a program (first published in the local press at 85,000 to 90,000 sf and later pared down to 60,000 sf); a construction budget it believed it could meet ($25 million, which did not change); and a streamlined list of potential architects (an interesting mix of Val Glitsch, FAIA, and Perkins+Will, Gensler and WW Architecture, Lake|Flato and Studio RED, Morris Architects, Leslie Elkins Architecture, and Jackson Ryan and Kieran Timberlake). Lake|Flato, Studio RED Architects, Val Glitsch, and Perkins+Will were called back for a second round of interviews, from which Lake|Flato and Studio RED were ultimately selected in late 2011. 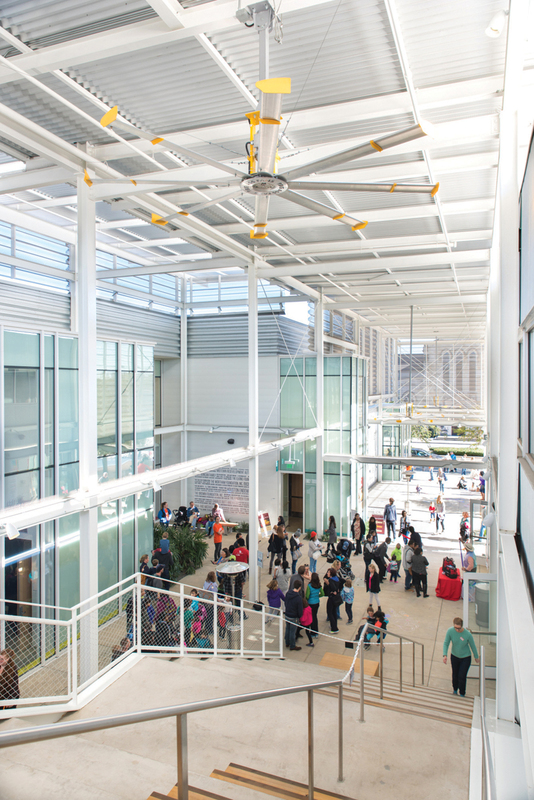 Bill Neuhaus, FAIA, a partner at Studio RED (which designed the new Houston Permitting Center and helped alert MATCH to the potential of the old parking lot) is known in Houston for his interest in nonprofit, public projects. He says he was intrigued by this project because of its urban design implications. He hoped that, located as it was — close to a light rail stop on Main Street in one of the few sections, outside downtown and the Texas Medical Center, where there is a pocket of pedestrian activity — the new theater could benefit from and help foster a lively urban node. 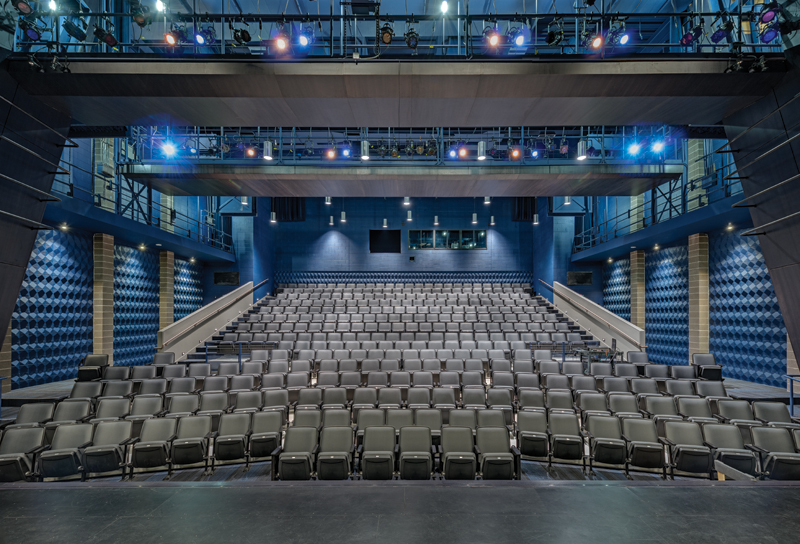 Perhaps even more than for Neuhaus’ focus on urban issues, Studio RED is recognized for its theater projects, among them the recent $46.5 million remodel of the Alley Theatre, which this author has criticized in other publications for not attending to the subtleties of the original design. Lake|Flato is quite simply the best-known Texas architectural practice after the legendary O’Neil Ford, FAIA. Neuhaus, Pete Ed Garrett, AIA, (another Studio RED partner), and Ted Flato, FAIA, came up with the building’s main urban gesture: a snaking, open-air lobby on which all the theaters open, running from Main Street to Travis Street. This served the triple purpose of physically opening the building to the neighborhood, allowing patrons of different shows to commingle, and reducing construction and air-conditioning costs. Many sidewalk critics pooh-poohed the open-air lobby, saying Houstonians accustomed to constant, subarctic air-conditioning would not stand for it. But with its vented upper roof, big ceiling fans, and strategic dumping of excess cold air from the theaters, the lobby after its first summer seems to be a successful design solution that responds to, rather than ignores, Houston’s Gulf Coast climate in a lively and imaginative way. The building’s main point of entry is at the corner of Main and Holman streets, facing toward the light rail stop. Here, the architects created a small plaza with a strategically located cafe with outdoor-only seating (that was just about to open when I visited the building in early September 2016). The architects diagrammatically translated the rest of the program into a block of four individual theaters along the north side of the lobby. Dubbed the “Matchboxes,” they range in size from 1,300 to 4,800 sf and seat from 70 to 329 people. The architects located a two-story block containing a rehearsal space, gallery space, and upstairs offices along the south side. (The performance spaces are subsidized to keep their rents affordable by funds from Houston First, the quasi-public organization that runs the convention center and several performing arts venues, including Jones Hall, Wortham Theater, and the Miller Outdoor Theater.) Once the schematic design was set, the architectural team divided the remaining work among themselves, giving the theater design to Studio RED and design of the building’s public spaces and exterior elevations to Lake|Flato. The theater interiors and surprisingly generous outdoor lobby are appealing for their extremely simple and straightforward design, urged along no doubt by the tight budget. The theaters are entered through small, glass-enclosed foyers with white walls that mitigate noise from the main lobby and act as air locks. Inside, the Matchboxes are all business. The two black box theaters have black floors, walls, and ceilings, with a drop-down grid for attaching lighting. The smaller of the two fixed-seat theaters is similarly utilitarian. The only bit of décor is on the back and side walls of the largest fixed-seat theater, which are clad with concrete blocks cast with a diamond pattern and painted dark blue. The exteriors are, unfortunately, not as successfully resolved. Here, “architecture” seems to get in the way of the program, which is so elegantly expressed in the budget-restricted but clever plan and the quiet, restrained interior spaces. The street-facing elevations are clad in a busy collage of different kinds of corrugated metal paneling, described on the MATCH website as being of the “Twenty-First Century stylized warehouse manner.” Visually, this breaks up the mass of the building and makes it seem smaller than it is, which is problematic because of the hulking masses of the apartments rising right next to it. Although the MATCH is not a particularly small building, with its jumbled facades, it seems downright dinky next to such neighbors. This is not to say that the choice of cladding — corrugated metal — is the problem, but rather its agitated deployment. 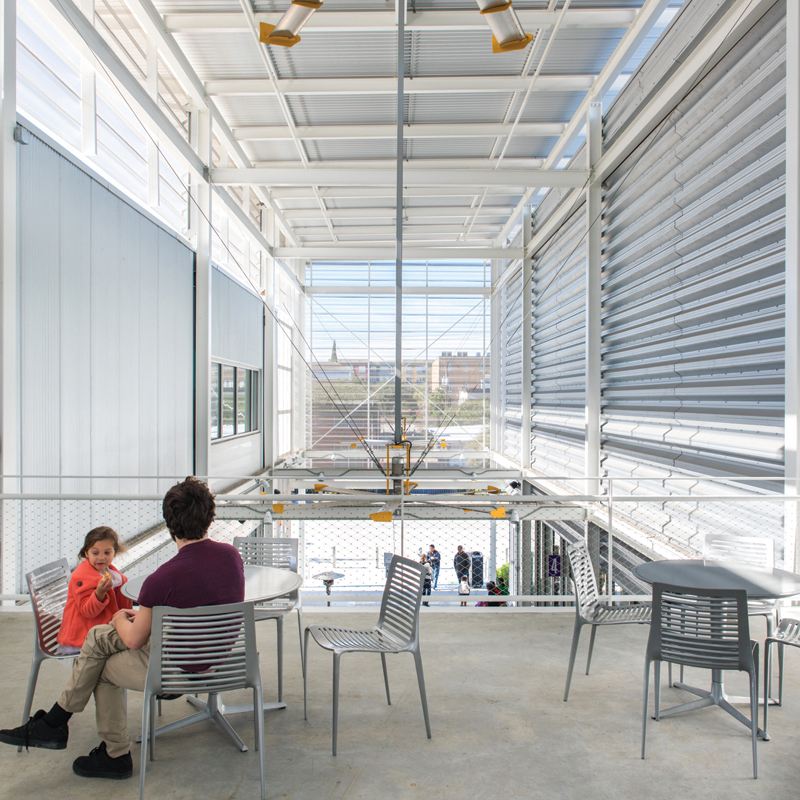 In Houston, this material has been associated with buildings for the arts since it was used on the storied Rice Media Center and Museum, quickly nicknamed the Art Barn, which was built on the campus of Rice University in 1969. Sponsored by the French-American art-collecting couple, Dominique and John de Menil, the Art Barn was their base of operations for years before they opened their renowned museum building, designed by Renzo Piano (1987). As another Houston arts writer told me, “Don’t worry about how it looks; think about how it works.” And this may really be the important part. Here, with the newly inaugurated MATCH, a ragtag band of Houston art groups has persevered in what at first seemed like an unattainable quest. This facility, so prominently located on Main Street, is the result of a dozen years of hard work. The MATCH is now so popular that it cannot host all the programs requested of it and will, in all likelihood, become a prototype for similar institutions in other cities looking to emulate its enviable success. Ben Koush, AIA, is an architect and writer based in Houston.